Pilot-Controller Radio Communications, Langley Flying School. Prior to flying Pilot-in-command (under your Student Pilot Permit without an Instructor on board), you will have to obtain your Radio Operator’s Licence. This entails writing an examination. The study material for this examination, as well as study questions, appears in Langley Flying School’s Flight Training Handbook Examination Handbook. This section reviews practical procedures with respect to radio procedures and will get you up and running. When you tune in a frequency, do not transmit until you are sure you are not interrupting an exchange of information between the controller and another pilot already on frequency. If an exchange between a pilot and a controller is taking place, simply wait until they are finished. Your first transmission should just include your aircraft type (Cherokee), and your four-letter identification (in the examples below we use GABC—when using the phonetic alphabet, this identification is stated Golf, Alpha, Bravo, Charlie. “Runway zero one. Winds zero two zero at five. Altimeter three zero decimal one zero. Taxi Alpha. Squawk three four zero two. ContactTower on one one nine decimal zero7 when ready. The controller’s instructions include quite a bit of information and it is a good practice to have a pen and paper ready so that you can copy down the altimeter setting (30.10”Hg in the first example, and 29.32”Hg in the second example) and your transponder code (3402 in the first example, and 0573 in the second example). At first it all seems rather rushed, but very quickly you will get used to the format with generally does not change. Finish your radio exchange with the controller before you input your altimeter and transponder setting. This is a good time to review transponder operations. The transponder is that small four-digit radio located in the “radio stack” of Langley Flying School aircraft—usually located just below the VHF navigation/communication radio (see right). As part of the pre-takeoff checklist procedures, the transponder is turned to “ALT” with the Code 1200 selected.8 When you make your initial contact with Control Tower equipped with radar display, ATC prefers to provide you a discrete or specific code when then enables them to attach or “tag” your aircraft identification to their radar display. In this example a landing clearance will be provided once the Cessna has cleared the runway. Unless you are extremely familiar with procedures, this information should be written down—for example, LB 25 – 1500. 13 With all the concentration required for landings and departures, it is too easy to forget a basic instruction. Always have a paper and pencil at the ready. An IFR pilot is required to write down clearances for reasons of safety and it is a good habit for all pilots to develop. Anticipate what the controller will say. If you are getting a taxi clearance, you know he will provide routing information. If you are inbound, you know he will tell you the runway in use, circuit clearance, and an assigned altitude. Make use of conventional expressions: ROGER, WILCO, AFFIRM,14 NEGATIVE. Be polite. At the same time, however, recognize “busy” and economize your transmissions accordingly. Overall, understand that you cannot operate in Class C Airspace (e.g., the Vancouver Terminal Control Area or Langley Airport) without a clearance from the controller; simultaneously, however, the controllers are there to facilitate your movement. The result is that pilots must make “requests” and operate according to the requirements of the controllers, but they expect controllers to be co-operative and facilitating. For reasons of safety (but it better be a good one), pilots can always over-rule a controller. If a controller issues you a clearance that you will compromise safety, simply deline the clearance and advise the controller. If the controller issues you an instruction, you can only not comply for reasons of safety and you must immediately advise the controller. Remember, controllers have their own safety mandate, and that is safely organizing the movement of numerous aircraft simultaneously. It is good advice that if you ever feel uncomfortable with a clearance—i.e., it deviates from your normal procedures or requirements to the point that you are uncomfortable with it—do not hesitate to request another clearance. “ABC up to five thousand five hundred." So often pilots respond to traffic advisories without relaying back to the controller whether or not they have the target aircraft in sight—simple acknowledgement of this sort technically relieves the controller of further responsibility. If, on the other hand, you advise the controller “Negative Contact”—meaning that you do not see the target—the controller is “kept in the play” and must provide additional separation information; additionally, the pilot of the target aircraft becomes aware of the continued risk caused by the lack of visual contact. As well, use careful language when responding to traffic advisories. You are at risk if you respond with the statements “Contact” or “No contact”—a burp in the VHF transmission could “cover” the word “No” and now you are dealing with a misunderstanding that could be really dangerous! Instead, use the expression “with the traffic” to indicate traffic sighted, or “negative contact” to indicate traffic not sighted. In the latter instance, again a landing clearance would be expected when you reach your final approach. After you switch, check in with the controller. “Tower, ABC with you on a Left Base zero seven." You don’t have to sound like an Air Canada pilot just yet, but the Examiner will expect you handle radio transmissions and receptions effectively during your flight test. At first it will sound absolutely confusing, but very quickly you will be able to decipher patterns and then radio work will make sense to you. Always request a back-track on Runway 19 and 25 departures—plan for the possibility of having to "reject" (abort) a takeoff when every foot of braking distance will be critical. Never accept a restricted-distance landing clearance ("GABC, Cleared to land 25, exit at Taxiway Hotel")—2000’ of tarmac provides adequate safety margins for abnormal occurrence, but does not for anything less. Never respond to a controller's exit instruction while still engaged in braking action to slow the aircraft on roll-out—the controllers know safe braking is your priority. Never attempt to comply with a controller instruction to exit “without delay” of “no delay” when the safe control of the aircraft is in doubt—controllers understand that the safe taxiing of an aircraft is not like driving a sports car. Never accept a "direct-to-the-threshold" clearance where such a clearance could jeopardize the stabilized configuration of the subsequent final approach. When the pace of operations heats up, everyone just has to keep cool and work as a team, controllers and pilots! 2 This important issue is further discussed below. 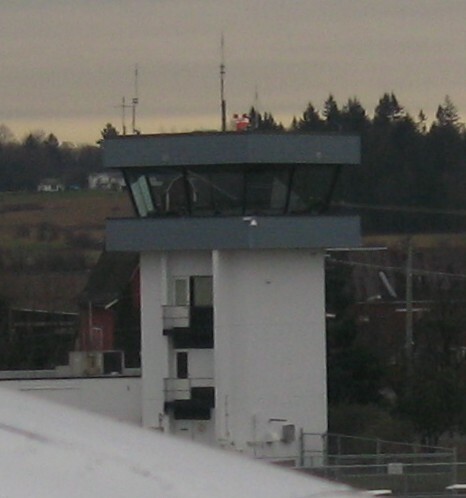 3 “Langley Ground” refers to the Air Traffic Controller who is working the ground frequency (121.9 MHz at Langley Airport) and who is in charge of aircraft ground movements at the airport. 4 Hangar 4B is the Langley Flying School Hangar—as a professional courtesy, company and school names are avoided. 5 “Information Charlie” refers here to the Automatic Terminal Information Service (ATIS) identification. The ATIS is a recorded message that is continuously broadcast over the ATIS frequency—in the case of Langley Airport, the frequency is 124.5 MHz. The message includes the current winds, altimeter setting, cloud heights, active runway, and any other information ATC wishes to provide to pilots planning on taking off or landing at the airport. Before they contact the controller, pilots listen to the ATIS; when they advise the controller that they have heard the ATIS, this information does not have to be repeated by the controller. The content of the ATIS normally changes throughout the day as winds, etc., change, and the phonetic identifier—in this example, “Charlie”—allows everyone to keep track of what information is current. 6 The direction of flight after departure. 7 The frequency for the Air Traffic Controller in charge of aircraft movements on the runway is the Tower Controller, and at Langley Airport, the frequency for this person is 119.0 MHz. 8 The Code 1200 is a generic setting used by all VFR aircraft at or below 12,500’ ASL. 9 ATC radar displays, and the associated software, are designed to set off an aural alarm whenever a “7” has been selected by the pilot (purposefully or accidentally) as the first digit of a transponder code. When this occurs, the controllers have to hit a reset button, and of course it can apparently become an irritation to them. There is lots of information in From the Ground Up regarding transponder operations and procedures (check the index at the back of this book). 11 We have simply written “GABC” in the above, but of course this should be voiced as “Golf Alpha Bravo Charlie” to make use of the phonetic alphabet. Notice too that the first letter—in this case “G” is dropped after the first exchange. Also note that the acknowledgement of a transmission by the pilot simply requires the repeating of the aircraft’s identifier. 12 Information “CHARLIE,” representing the letter “C” in phonetics, refers to the fact that we have listened to the ATIS (Automatic Terminal Information Service) recording named Charlie and have received the current data regarding airport operations. Importantly, a good pilot always writes down the ATIS so as not to forget crucial information. After the ATIS is copied, the altimeter setting should be immediately updated—don’t defer this as you might forget. 13 For this and other reasons, a pilot should always have a notebook on hand—something that is small and will not get in the way in the somewhat cramped cockpit environment. 15 Note that it is not required by the Canadian Aviation Regulations for a VFR aircraft to readback a clearance unless asked to do so by a controller (readbacks are mandatory for IFR aircraft). All students of Langley Flying School, however, are required to read back “takeoff” clearances, and “taxi to position” clearance—because of the dangers of collision owing to misunderstanding or miscommunication. 16 Letters—in this case “Papa” for P and “Alpha” for A—are used to identify taxiways (as opposed to numbers used to identify runways). 17 Don’t get confused with reporting clear of the control zone—this is not a requirement (unless the controller specifically tells you to do so) and is considered unnecessary use of the frequency. 19 The outer and inner controllers are sitting next to each other in the tower cab (control tower) and are continuously exchanging information—really quite interesting how they work.